goaroundtours.com brings this amazing holiday package through which you can cover the three glorious and historic cities of Northern India, Delhi, Agra and Jaipur. One of the most famous tourist circuits in India, this Golden Triangle Tour will take you through historic cities of Delhi, Jaipur and Agra. This 5 nights and 6 days tour is especially designed for travelers who wish to explore the historic and regal charm of three beautiful cities, Delhi, Agra and Jaipur. This week long tour package gives you an opportunity to explore the Golden Triangle Route- Delhi, Agra and Jaipur along with the blissful city of Pushkar, where you can find the one and only temple of Lord Brahma. This 7 nights’ tour gives you an opportunity to explore the three cities which make the golden triangle circuit, Delhi, Jaipur and Agra along with visit to Jodhpur and Udaipur, the two iconic cities of Rajasthan. Enjoy a wonderful holiday experience in India with this enticing golden triangle tour covering the three royal cities of India, i.e., Delhi, Agra and Jaipur. 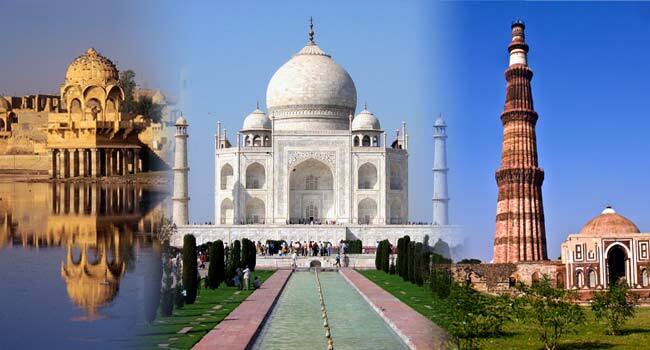 This 5 nights and 6 days tour package of goaroundtours.com covers the three historic cities, Delhi, Agra and Jaipur, which makes the famous golden triangle circuit. For those who love the luxury, goaroundtours.com presents this golden triangle which includes visits to historic attractions of these three destinations i.e., Delhi, Jaipur and Agra with stay in 5 star hotels. goaroundtours.com brings this golden triangle tour covering the three golden cities, Delhi, Jaipur and Agra while enjoying utter luxury and comfort of 5 star hotels.